I don't have any extra-special Valentine's Day post this year. Although I treated my loved ones with the utmost kindness yesterday, I wasn't in the kitchen whipping up heart-shaped sugar cookies or champagne truffles or pink macaron lollipops–so I have nothing along those lines to offer. You can blame it all on my Mom, who each February 14th handed us a ritual card or a store-bought sweet–but let it be known this was but a Hallmark Holiday, and she would never pretend otherwise. Thus disabused, I now tend to follow her ways when it comes to Valentine's Day: ever-so-slightly observant but not devout. So, what I'm here to talk about is granola. Not too romantic, I know–the name itself doesn't quite have the musical ring of éclair or meringue or millefeuille. But this treat I'm offering is honest and fortifying and crisp. My friend Tara shared it with me after her cousin, Kristen, put her on to it. 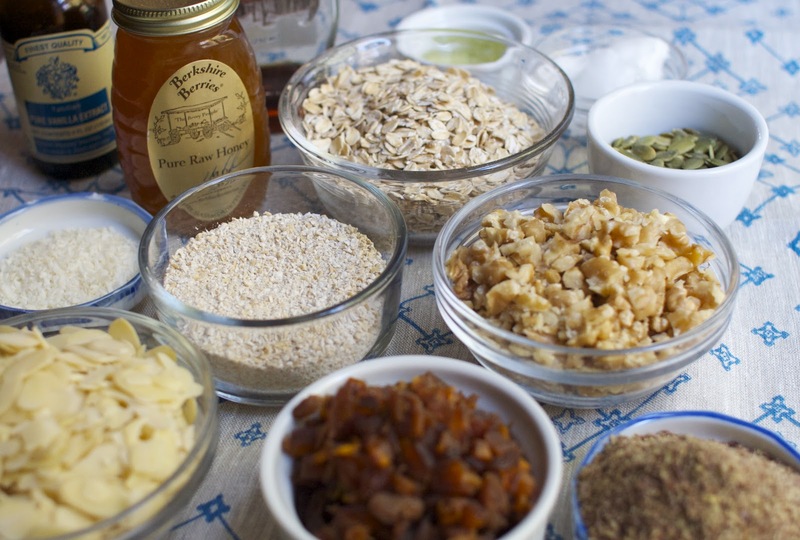 This recipe is like an edible game of "telephone" that evolves a little with each round (Tara added coconut oil and flax seeds; I threw in maple syrup and chopped, dried apricots). Pass it along...I'm sure it'll change again before it's all over. 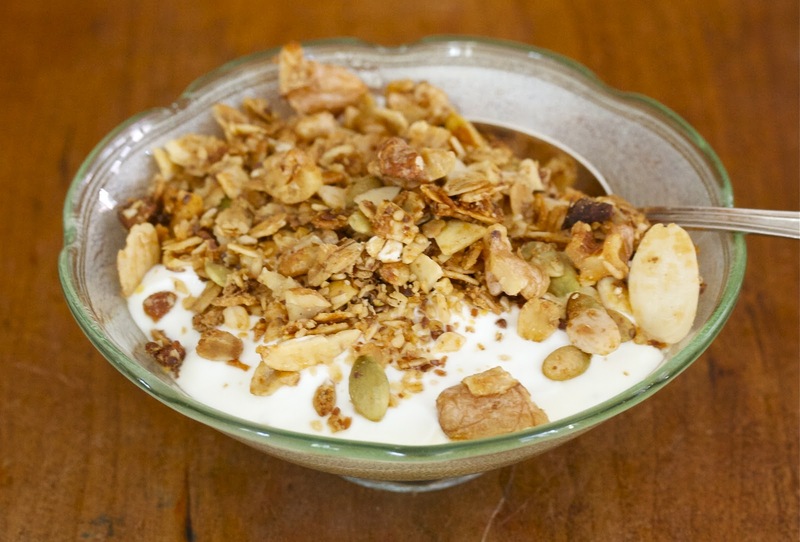 This also happens to be the first granola I ever made, and now I ask myself why I waited so long: granola's not cheap in stores around here, and there is nothing worse than paying $8 for a quart of stale, hyper-sweet oats. 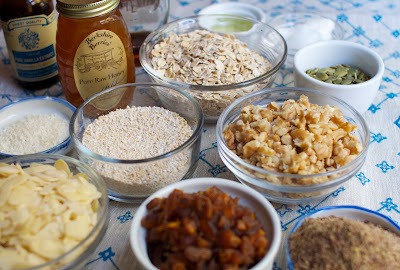 Making your own big batch every week or two and stashing it in mason jars just makes sense. After you stock your cabinets and measure out the ingredients, all you have to do is mix and bake and attend a bit–virtually no technique or skill whatsoever is required. What I like about this recipe is the super-nuttiness and the mellow, just-right sweetness supplied by honey and maple syrup. And, there's just the right amount of coconut. Normally, I avoid coconut in baking altogether, because the aroma tends to stir up bad teenage memories of overzealous tanning sessions and a dalliance with Malibu rum that ended badly. But this may be the recipe that changed my mind, since the coconut flavor translates to a subtle warmth and adds an extra measure of crispness. Just a couple of notes: if you use dried fruit, make sure to add it afterward–I made the mistake of baking the apricots in with the rest, and they hardened into acrid little nuggets. Also, be sure to stir the granola around occasionally as it bakes, so that the nuts and grains brown evenly. Preheat oven to 325˚. Mix together dry ingredients (except for fruit) in a large bowl. Whisk together liquid ingredients in a medium bowl, then drizzle over dry ones, mixing to coat evenly. Spread onto a tray lined with silpat or parchment, and put in medium rack of oven. Bake for 20-30 minutes (depending on your oven), stirring every 10 minutes or so to redistribute browner “edge” pieces with less cooked “middle” pieces, until beginning to turn golden brown. If you’re using dried fruit, stir it in when you remove tray from the oven. Cool—granola will crisp as it cools down–and store in an air-tight container. This recipe makes about a quart and change.